If recording is in progress press green button on the remote and confirm standby [OFF]. When setting up new timer from EPG, press green button instead of red and set Standby to [OFF]. If set to [ON] the PVR will go to standby when recording is finished. When recording has already been set, press timer on the remote control, select any timer recordings you wish to edit and set Standby ON or OFF. Changing the length of recording which is in progress. Press Menu > Multi Media > PVR and change the recording time. During playback when adds start press numerical 1, 3 or 4 and the layback will skip 1, 3 or 4 minutes accordingly. 8000T Recovery when PVR won't boot. Symptoms: The PVR enters an endless loop trying to recover and won't initialise into menu or viewing channels. A firmware upgrade to version 27500 will restore access. The hard drive must be disconnected from the main board to load the firmware. Disconnect power to the receiver and remove the seven screws securing the top cover. 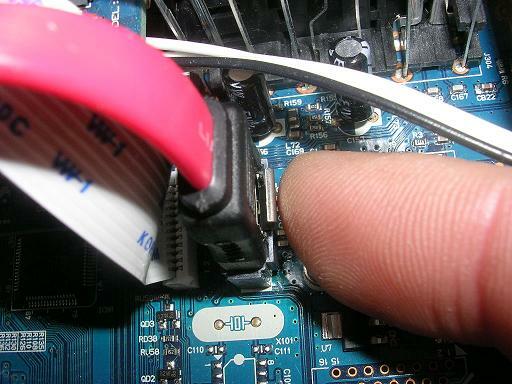 The hard drive data cable is the thick 15mm wide red cable that plugs into the board socket towards the faceplate. Squeeze the metal clip on the plug while pulling it upwards to disconnect. Plug a flash drive with the firmware .dlp upgrade into the receiver's USB socket. Connect the receiver to the mains and power it on. Navigate from menu>multimedia>USB 1 or 2 (where the firmware file is located)>*.dlp, highlight the *.dlp file and press OK on the remote handset. A message will appear onscreen asking for confirmation to replace the firmware. Highlight “yes” and press OK, then a message warning not to disconnect during the process and a progress bar will appear. When the file is loaded, the receiver will reboot. When the receiver has rebooted, disconnect the power once again and plug the red data cable back into its socket. Screw the receiver's cover back on, and power it up once more. Once the reboot with the new firmware is completed, the receiver will require about 3 – 4 minutes to read the hard drive and recognise the files on it. When that's done, a message reading “ HDD is now connected” will flash briefly onscreen and the receiver will refer to it correctly. We recommend that you reformat the HDD . Menu > Multimedia > HDD > press yellow key and wait for completion banner to appears. This process will delete the HDD recording files. If you wish to keep certain files you can offload, copy them to a USB SD stick or to your PC via the network connection. All other functions are unchanged, the one difference is the longer period to address the hard drive at power up or power on. The receiver allows for this when recording is scheduled from standby or sleep.